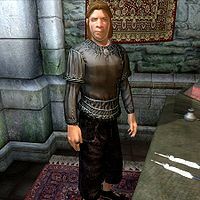 Hamlof Red-Tooth is a Nord trader and proprietor of the fashionable Red Diamond Jewelry in the Imperial City's Market District. While many of his merchant colleagues take the opportunity to get a breath of fresh air after closing time, Hamlof keeps to himself and never leaves his shop. He sleeps in the Living Quarters above the main trading room every night between midnight and 6am. He starts the day relaxing and strolling around for two hours before he heads downstairs at 8am. Here, he unlocks the door and spends the next twelve hours offering his services to the occasional customer. At 8pm, he locks up, and consumes a two-hour dinner seated in one of the chairs near the stairs. He finishes his day wandering around the shop before he finally calls it a day at midnight. He wears the rare zero-weight black wide pants along with the semi-rare highwayman's shirt and gold trimmed shoes. As his inventory fills up every time you sell him something (see bugs), his choice of worn jewelry varies, but he starts out with a jade sapphire ring and a silver necklace. He also carries the Bit and Bridle key (which opens the two display cases in the shop), and a small amount of gold. Another Nord by the name Hamlof Red-tooth was seen in Morrowind, as a smuggler in the Zanabi cave. Whether they're meant to be the same person is unknown. The unique Spectre Ring should be available for purchase from Hamlof. However, the container it's in is mistakenly labeled as belonging to Ris Fralmoton, a horse-seller who is not even in the game, which means that this ring cannot be acquired. Hamlof is one of the few merchants in the game who does not have a merchant chest and therefore keeps his entire stock of merchandise on his person. He will wear the best quality items in his inventory, including enchanted items purchased from you. One implication is that items he offers for sale can instead be pickpocketed from him. Another implication is that any items you sell him will never disappear: if you need quick cash, you can sell him items you may later need, then return and buy them back. This bug is fixed by version 3.0.0 of the Unofficial Oblivion Patch. This page was last modified on 7 September 2018, at 19:14.